More alternatives, so you have more flexibility to type different sentences. Traditional Chinese solutions are acceptable! Wide range of vocabularies and idiomatic phrases. Despite inaccuracy in some translations, reports per problem contain great suggestions and explanations! The creator team rushed through the last set of lessons, so there are less alternatives and ambiguous translations from English to Chinese. No pinyins since this is "English-for-Chinese" course. If you want to read Chinese, Google translator does all the job in detecting most pinyins. The minor issue is that Google translator wouldn't best work for some learners who learn different dialects (i.e. Taiwanese-Mandarin) other than mainland Chinese. If you are to pass the test from 4/5 progress per lesson set, no multiple choices are given to you per translation problem. That means: manual typing ONLY. Lack of accessibility to ask for help in forum for traditional Chinese. garpike had shown his screen with simplified characters to me, indicating that the forum section works. Unfortunately, list of vocabularies is not available for this course. Lack of accessibility to ask for help since English-for-Chinese forum section is currently not available. The English-from Chinese forum is here, and is perfectly accessible to me from the English-from Chinese course, as are the sentence discussions (I'm unclear which you are referring to). Are you accessing the course from Mainland China? It's possible that certain IP addresses are redirected to a version without discussion on a geographical basis, or it might just be an A/B-test. Well done on reaching level 25. 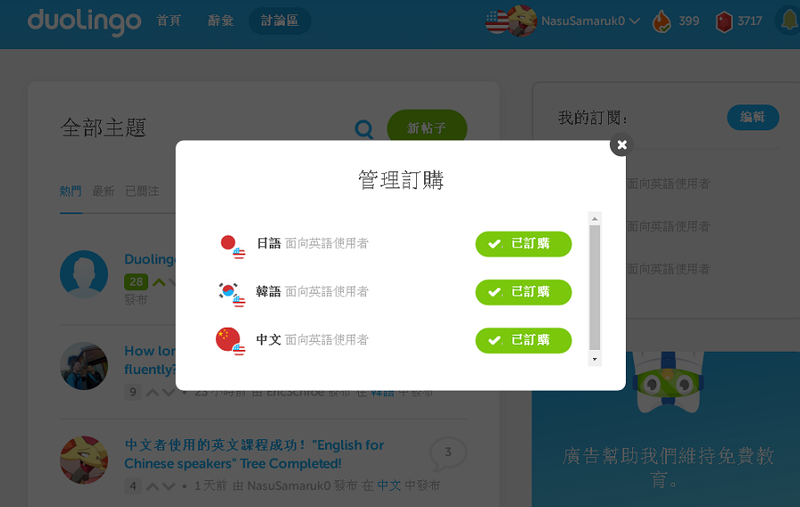 Unlike the sentence discussions in English version, the sentence discussions in Chinese version can be accessible only while learning a lesson set. My link is the correct link for the English-from-Chinese forum (i.e. discussion for the course written in Chinese that teaches English); the discussion for Chinese-from-English is here (ending '951' instead of '833'). Going by your screenshot, you don't seem to be subscribed to the en-from-zh forum, which is odd, as I thought this was automatic upon starting the course. I have added a red arrow to point out the subscription icon and a blue arrow for the sentence discussion (which you should also be able to access directly from here). If you cannot see these, I'm not sure why. I notice you have Chinese text displaying in traditional characters, which I presume is an add-on of some sort, as there is no longer a setting in DL to do this natively; it is possible that this or some other add-on you have installed might be preventing the subscriptions from showing up as they should. I can view and edit all my forum subscriptions from any course in any base language. Have you tried accessing the course from different/clean browsers/computers? Actually, there was an option in the settings, where traditional chinese can be switched manually from simplified without any add ons. In fact, I already set in traditional characters before the option was removed. I did access from the clean computers and browsers. Nothing tricky. EDIT: I have edit the cons from the main discussion, making note that the forum feature is not available for some users with trad. Chinese characters set from settings. That can give Duolingo the good heads up. 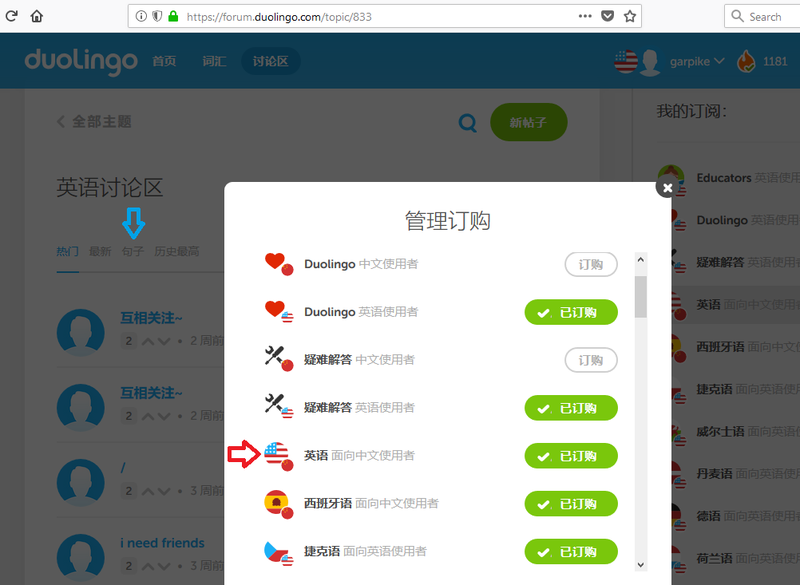 I also had Chinese text set to traditional when the option existed, but it switched me to simplified when the site was changed and there was nothing I could do about it. I naturally assumed this was the same for everyone. I suspect there are A/B-tests at play here. In particular, there is one called 'forum_web_rewrite' that sounds like it might be responsible for the forum subscription differences.